Pulse start metal halide ballasts are designed to use a higher starting voltage to power a lamp than probe start models, which gives the lamps a faster restrike time and higher lumens rating. We carry pulse start MH ballasts, including all necessary hardware and kit pieces in a variety of wattages. 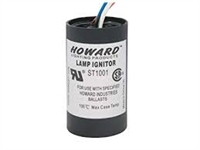 Most models feature a quad tap design, and all models include ignitors and pre-wired capacitors. Call us at 217-806-0502 with questions and enjoy free shipping on your order of $99 or more!